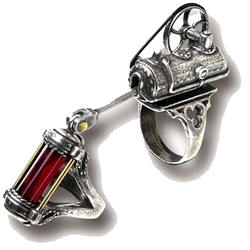 Our Dibnah's Venesective Blast Pipe Ring is a ingenious invention based on Dibnah-pioneered principles, for intravenal pressure control when traveling at very high velocity, or altitudes over 35 mph, or above 1,000 feet. Articulated finger ring with glass rod cylinder and adjustable lower shank. This Gothic ring is hand cast from fine English pewter. This ring has been discontinued and we only have one in size 11 Left in stock. Our products are research, conceived and designed in England. They are made by highly skilled hand craftsmen in England. The Metal used in the manufacture of all of our pewter products is the highest grade, 92% tin alloy, better known as "English Pewter". Pewter like silver, may tarnish, but can easily be polished up to a brilliant lustrous shine, using a brass or silver polishing pad and a wipe with a dry cloth. Do NOT put pewter into a salt water dishwasher, which could corrode a polished surface. If taken care of properly, you should have years of wear for any Gothic, Medieval, Renaissance Romantic Dinner Party or a Great touch to your bedroom for a romantic evening. Great gift idea for any Birthday, Graduation, Anniversary, Weddings, Baby Showers, Girl's Night Out, Sweet Sixteen or any party occasion.